We begin our 16th round of the (Vitamin) Alphabet — Vitamin A for ACCENT… Take the time to accent your Lent… to accent your relationship with the Lord… to really accent listening to His voice in your life. Where does He want you to be? What work can you do to serve His Kingdom? His people? Accent listening — as our guest BETH LYNCH has done. After losing her husband at a relatively early age, Beth moved to upstate New York, where she became the full-time Director of the Shrine of the North American Martyrs. 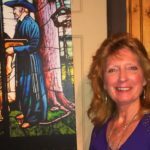 Beth is wonderful to spend time with – we relearn some of the fascinating and important history of the spread of the Catholic Faith among various Indian tribes..The Shrine of Our Lady of Martyrs is located in the hamlet of Auriesville in Fultonville, NY. Once the 17th Century Mohawk Village of Ossernenon, it is now a Roman Catholic shrine dedicated to three Jesuit missionaries who were martyred here, and to St. Kateri Tekakwitha, a Mohawk/Algonquin woman who was born here. Into the wilderness of the native tribes, the New World received European fur traders, Dutch and French explorers and settlers, Jesuit and Calvinist missionaries. These unrelated pockets of activity converged at this unlikely plot of land the Mohawks called Ossernenon (Auriesville). The Saints of Auriesville Museum places the North American Martyrs and St. Kateri Tekakwitha into this historic context, making evident the sacrificial courage and charity that brought Catholicism to the Mohawk Valley and to what became New York State and the Roman Catholic Diocese of Albany. By way of this museum, pilgrims receive an important catechesis on evangelization and martyrdom, as well as an intriguing history lesson. They come to understand why, throughout the Shrine’s 135-year history, pilgrims have described a sense of peace on these grounds – it is because the grace of sacrificial love and forgiveness penetrate deeper than blood and pain. Go to www.auriesvilleshrine.com to see pictures and history on display… Our ACCENT this show is on the importance of the spread of the faith in early America — spread by the blood of martyrs. In our show, we feature a bit of the music of Tori Harris – a guest on our last show… She’s not only a highly honored singer and musician, she’s an author and speaker… and we’re offering her book HOLY SPIRIT 101 free to some listener… Send your request to catholicvitamins@gmail.com. We also featured one song — Holy Spirit performed by Francesca Battistelli — a most delightful, talented and multi-faceted singer who we’ve been ‘after’ for over a year… please someone tell her about the Catholic Vitamins Podcast. Blessings one/all… We’ll see you in a couple weeks. This entry was posted in Podcasts and tagged North American Martyrs, Vitamin A. Bookmark the permalink.